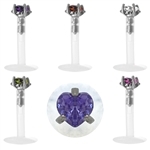 BIO-FLEX 16 GAUGE MONROES WITH GEM IN COLORS INCLUDING CLEAR,PINK, AB IRIDESCENT,AQUA BLUE,LIGHT BLUE,TANZANITE,BLACK,DARK BLUE,PERIDOT GREEN, HOT PINK,EMERALD DARK GREEN,AMYTHEST DARK PURPLE AND RUBY RED. THESE NEW MONROES ARE VERY COMFORTABLE TO WEAR,THEY ARE FLEXIBLE AND A HOT NEW LOOK. AVAILABLE IN 8 OR 10MM. 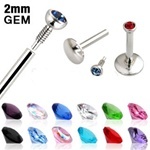 THE QUALITY IS PERFECT AND THE GEM BALL FITS VERY TIGHT AND SECURE WITH VACUUM SEAL TECHNOLOGY. GENUINE OPAL STONE INTERNALLY THREADED MONROES.COMES IN VARIOUS COLORS OF 100% GENUINE OPAL STONE SHOWN BELOW.TOP QUALITY 316L SURGICAL STEEL 16G INTERNALLY THREADED WITH TINY 2MM OPAL STONE. 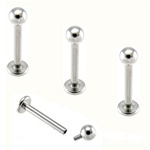 2mm gem 5/16 inch post 16 GAUGE PUSH-IN MONROES WITH 2MM FLAT C.Z. GEM. TOP QUALITY EXCLUSIVE PUSH IN DESIGN VERY EASY TO USE JUST PUSH IN AND YOUR DONE NO SCREWING IN NEEDED. 100 PIECE ASSORTMENT OF 16 GAUGE SPIKE OR BALL MONROE. 316L SURGICAL STEEL 8 AND 10MM 16 GAUGE INTERNALLY THREADED TITANIUM ANODIZED TINY 2MM SPIKE OR BALL MONROE.COMES IN TITANIUM ANODIZED COLORS SHOWN BELOW. MONROES ARE FOR PIERCINGS JUST ABOVE THE LIP ON EITHER SIDE OF YOUR CHEEK(LIKE THE MOLE ON MARILYN MONROE).